Ichikawa Danjuro XII as Benkei. From the series: Heisei Yakusha Okagami. Size: 42 x 30 cm. Ichikawa Danjuro XII was born in 1946, and became Ichikawa Danjuro XII in 1985. Danjuro XI died in 1965, 2 years before Paul Binnie was born. 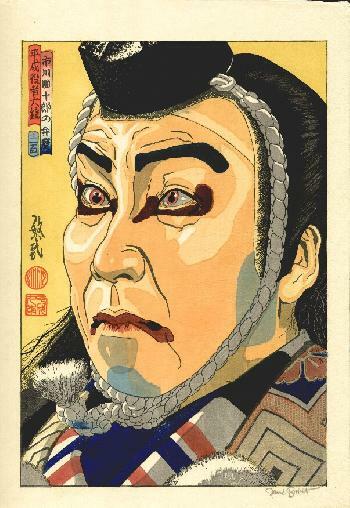 Ichikawa Danjuro XII is the latest scion of the line of Kabuki actors that started with Ichikawa Danjuro I, who died in 1704.